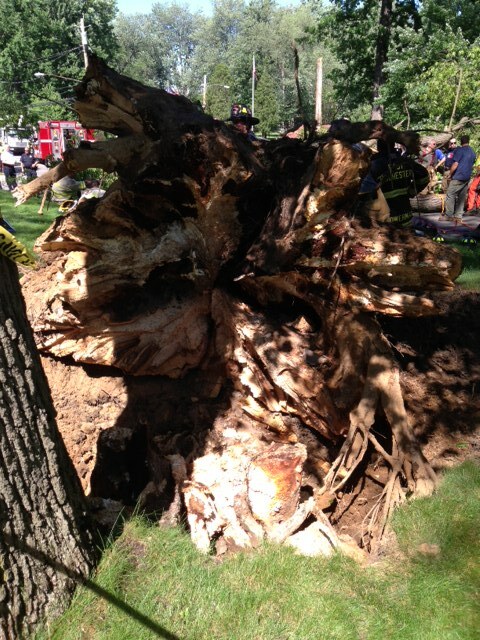 Root rot, which is very evident in the photo, caused this giant tree in East Rochester to fall. A recent weekend of high winds, capped off by a horrific tree-related fatal accident, brought into focus the vulnerability of trees. They may appear solid and healthy, but it is difficult for the untrained eye to know what is going on inside a giant tree. That’s why trees should be inspected by a certified arborist at least once a year. This may seem like an unnecessary expense, but rest assured that it is one of the most important investments you can make to protect your safety and your property, as well as your neighbors and your community. Planting a tree is like acquiring a pet. When you make that decision, you assume responsibility for its health and wellbeing, and it is a legal obligation that can include significant costs and penalties if a tree fails. While high winds contribute to tree failures, the vast majority of trees weather such storms with little or no damage. So, there must be a reason why only certain trees fail. In my 30 plus years of arboricultural experience, I have found that wind related tree damage is not random. Some people, arborists included, will suggest that trees’ size and leaf mass are too much for high winds, but nature engineered trees to flex in the wind. Rather, most broken branches and failed trees are weakened by rot or other diseases, weak branch attachment to the trunk or large limb, or other natural or environmental compromise. In the case of last weekend’s fatal accident in which a tree fell on a passing car, the roots were so rotted that they were not anchoring the tree. It was ready to fall. A mere breeze could have caused that giant tree to topple. A certified arborist can diagnose the presence of fungi and rot, and the extent of the damage. The untrained eye cannot usually detect these problems until they see external signs, such as mushrooms growing out of the base. These are fruiting bodies, which indicate that the disease has progressed to the point that immediate action should be taken. The presence of rot may not spell an immediate death sentence for your tree. Since rot usually destroys trees slowly from the center out, you may be able to enjoy your tree for decades before it becomes a hazard. It is better to maintain such a tree under an arborist’s care than to not spend the money and hope that the story doesn’t end tragically like it did in East Rochester. Hi there every one, here every person is sharing these kinds of know-how, so it’s pleasant to read this web site, and I used to go to see this web site all the time. A certified arborist does not generally know how to diagnose root disease problems and rots- unless the rot is painfully evident with crumbling wood that is visible from 100ft away. To catch it in time, requires highly specialized skills and maybe a laboratory. Thanks for the information! I’ve always wondered why some trees fall over from wind damage. It’s really interesting that it’s actually caused by the amount of rotting that a tree suffers rather than how forcefully the wind is blowing. That’s what I used to think as a kid when I saw an old tree fall over during an intense storm. Now I know that it actually fell down because the limbs rotted so much that it couldn’t stay up. That would explain why my neighbors are so concerned for the health of their trees. I wouldn’t want any of the trees in my yard to fall over on anything or anyone, so it seems like I should have it checked out by a tree service from time to time to make sure that it isn’t rotting.